Have you ever made a cheesecake base using ginger biscuits? I saw this recipe today after finding my ginger cookies were a packet full of crumbs and wondering about a recipe I could use it for. Thank you. I have a packet of Marie biscuits and will try half and half. Is your measurements a 200 G pack of chocolate digestives? I am not home and can’t remember the size. I made these in little cupcake size for the school faimly dance night at our school..50 at a time… Well I have 50 people wanting the recipe… love it I have now been asked to make them for the fete and the year 3 disco… lucky me.. Thanks for the best recipe ever I will be making them alot I think.. This is one great recipe for me! You know why? I love… correction.. OUR family both love chocolate and cheese! And your recipe has that perfect combination! Thanks so much for sharing this recipe! 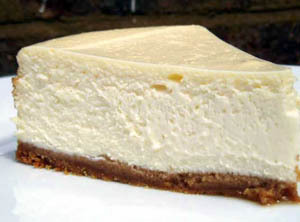 Thanks for this recipe – our whole family just love cheesecake, so I had to try this one. Just one question – is the cooking time correct? After baking and cooling, when I removed the springform tin, my whole cheesecake fell apart. Can it be baked in a square oven-proof dish instead of using springform tin? thanks for all the delicious recipes – so glad I found this website. Hi Di, soory for the late reply, been in Cape Town for a few days… hot, hot, hot. It should hold it’s shape if completely cooled and a little time in the fridge can only do it some good. With hot weather like we are having it may be a little loose. I will try it again, and cool in fridge before removing tin. But maybe will try baking it in square dish.